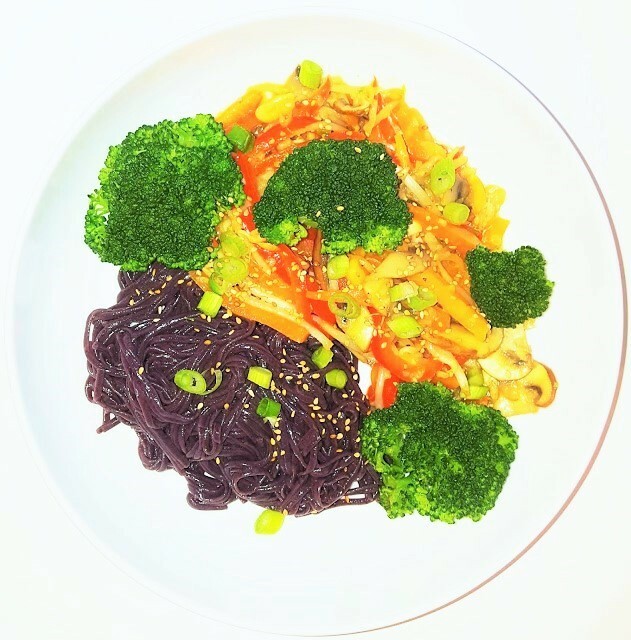 I picked up these black rice noodles recently and I've been dying to try them with something! Stirfry is one of those tasty, easy dishes that's perfect for evenings when you just can't really be bothered 'cooking'. This recipe is really simple and uses minimal ingredients - most of which you will probably already have in your fridge/cupboard. Note: When making stirfry I find that I always over/under cook broccoli so I now just steam it and add it in at the end, this way it gets cooked properly and retains its lovely green colour! Heat some sesame oil in a non stick pan on medium heat. Add garlic, ginger, and carrots and stir fry for 2 minutes. Add peppers, mushrooms and peanuts and stirfry for a further 2 minutes. Whisk together aminos, 'chicken' stock powder, a few tablespoons of water and cornflour (if desired) then add this to the pan. Stirfry for a further two minutes then serve with your choice of side. Top with sliced spring onions and toasted sesame seeds.